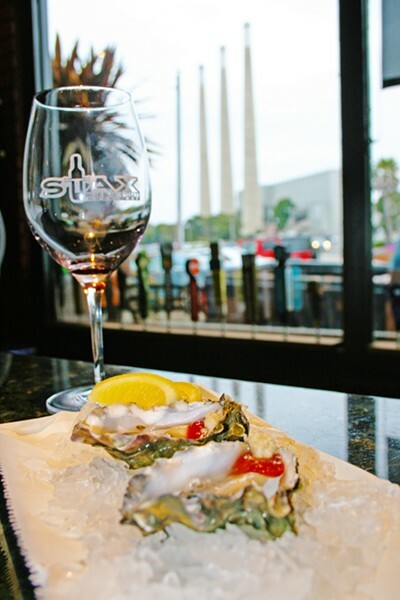 Stax Wine Bar is located at 1099 Embarcadero in Morro Bay. Hours are Sunday through Thursday from noon to 8 p.m. and Friday and Saturday from noon to 10 p.m. For more information, go to staxwinebar.com. Love 'em or hate 'em—those three towering stacks represent more than just the remnants of Morro Bay's old power plant. I mean, they've got a craft brewery and wine bar named for them, after all. You can take your postcard view of Morro Rock and all the pesky tourists and seagulls that go with it. I'll take a comfortable seat at Stax Wine Bar and Bistro, which offers up an unobstructed view of those hotly debated pillars. WINE BAR BUSTS OUT Stax Wine Bar and Bistro, located at 1099 Embarcadero in Morro Bay, has grown from a wine shop to a lounge to now a bustling bistro serving up meaty morsels, fresh seafood, and more. 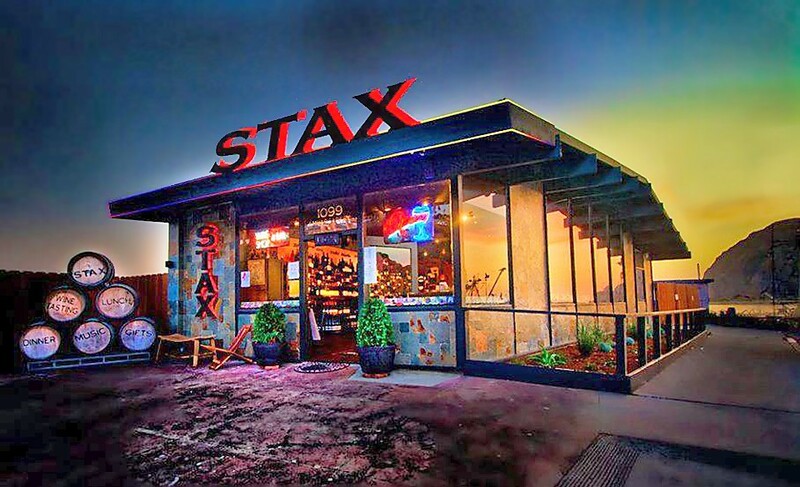 Located on the unhurried north side of the Embarcadero, Stax feels removed, like an authentic locals hangout. That's because it actually is. Owner Giovanni DeGarimore, who also operates Giovanni's Fish Market and Galley a few doors down, wanted to open up a casual wine shop and bar—a place where you can kick back for a spell and take a local bottle of tempranillo home with you. Today, the walls are still lined with glorious red and white wine bottles, but there's also a lot more going on with the food menu. Sure, you've always been able to grab a nice nosh at Stax, but now—thanks to a new creative force in the kitchen—you can also dig into sous vide filet mignon so tender you can cut it with a spoon. Enter Kari Ziegler, former chef and proprietor of Arroyo Grande's Comfort Market. Thanks to her, Stax Wine Bar has recently added "and Bistro" to its moniker. You may remember Ziegler's own former wine bar, Gather, also located in Arroyo Grande. The chef said that—before they ever worked together—she and DeGarimore were "wine bar cousins." "When he first opened Stax, it was a wine shop, but it quickly became a place to hang out; and I had the same thing happen at my place," she said. "I thought I'd serve a few people and have a couple tables. The next thing I knew, everyone was coming for live music." It's not a bad problem to have, and I'd argue that this is the natural progression of a good locals lounge. CHEF BY THE SEA Kari Ziegler, former chef and proprietor of Arroyo Grande's Comfort Market in Arroyo Grande, has combined forces with Stax Wine Bar and Bistro in Morro Bay. 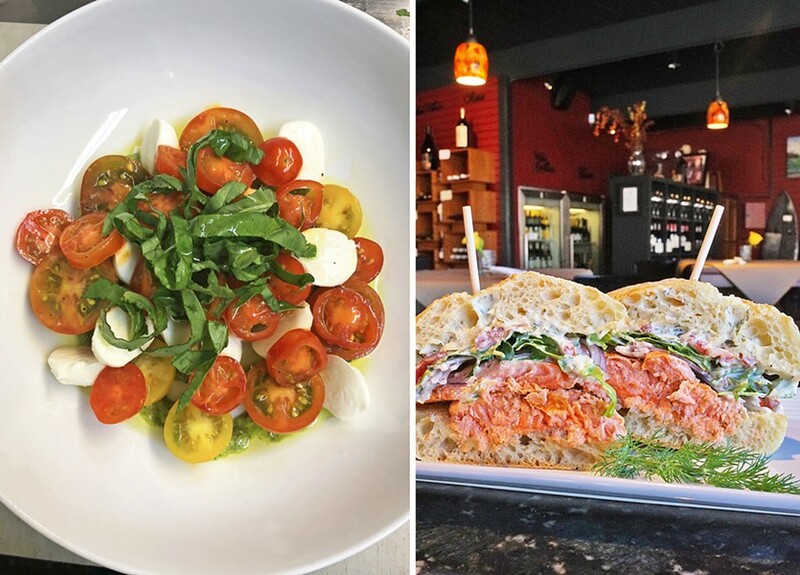 Try her heirloom caprese cherry tomato salad with house-made pesto (left) or a stacked panini for a fresh summer bite. As Stax's popularity has grown over the past eight years, DeGarimore has continued to listen to the community. Live music kicks off Thursdays and most weekends and the bistro hosts a happy hour each weekday from 3 to 6 p.m. with dollar oysters. Stax wine club members who join up for a curated selection of bottles four times a year get to enjoy happy hour all day. You can now find craft beer on tap as well. In tandem with this progression, Ziegler has boosted the culinary offerings to take any regular night into date-night territory. She's churning out charcuterie, crab cakes, salads, desserts, and a variety of crostini and panini. Produce is often sourced from local farms, and you can taste the freshness in the peppery, SLO-grown arugula and nutty house-made pesto. "We have a simple but really delicious menu, and I put my own twist on a few things," the chef said, adding that the tender filet mignon crostini is bolstered by funky, French Saint Agur blue cheese, fragrant black truffle, earthy mushrooms, and that famous aforementioned pesto. Also expect a juicy prawn cocktail, snackable pommes frites, panini sandwiches laden with prosciutto and fig spread, mushroom flatbread, bourbon glazed pork belly, fried Brussels sprouts, and crunchy greens topped with house-made Caesar dressing and white anchovies. I can say from experience that the caprese salad with heirloom cherry tomatoes, tomato vinaigrette, marinated mozzarella, basil, and EVOO is a breath of summer deliciousness (also, that steak crostini is totally sharable, if you want it to be). The local Grassy Bar oysters on the half shell served with lemon, horseradish, and house-made cocktail sauce are a Morro Bay classic. The locally farmed morsels are absolutely divine—but that's not at all shocking. "One thing I really love about working here is being owned by Giovanni's Fish Market. Normally, a small little wine bar wouldn't be able to get such small quantities of premium seafood. At Stax, I get a bag of oysters anytime I need, and I can get the best shrimp if I want. I'm just like a kid in a candy store." Although Ziegler appreciates fried seafood and its place on the Embarcadero, you won't find any battered cod anywhere on the menu (you will, however, find lightly battered and fried squid, because, well, that's just nonnegotiable). ON THE HALF SHELL Oysters on the half shell, local wine, and a beachy view? This is real life at Stax Wine Bar in Morro Bay. Owned by Giovanni DeGarimore of Giovanni's Fish Market & Galley, Stax is able to offer up fresh seafood whenever a good catch is hauled in from the bay. You also won't find octopus here, despite its trendiness. You might recall Fred, the 70-pound octopus hauled in by Morro Bay fishermen last May that was famously released back into the ocean by DeGarimore himself? "The staff enjoyed having Fred around, and we all greeted him daily," Ziegler said, adding that sustainability and respecting the ocean is important to the entire team. When you work this close to the sea, the lines tend to blur. "I had never been a real seafood person because it was so hard to find sustainable, fresh options for my customers," Ziegler said. "Now, it's a bit different. I walked out one morning and the fishermen were shoveling in beautiful pink shrimp from Morro Bay, only available a few weeks a year." The chef got to work crafting fritters topped with the fabulous pink shrimp. Hayley Thomas Cain is in love with Fred the octopus. She can be reached at hthomas@newtimesslo.com.